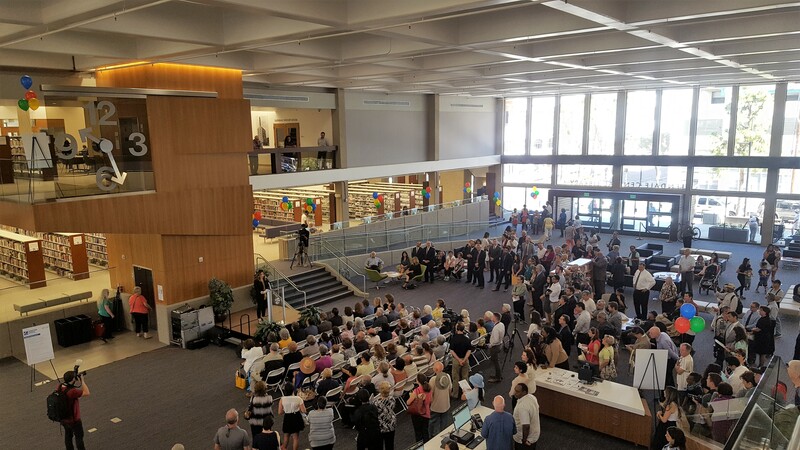 John A. Martin & Associates, Inc. Glendale Library Reopens After Extensive Rehabilitation - John A. Martin & Associates, Inc.
JAMA employees Barry Schindler and Ben Rogowski attended the reopening of the Glendale Central Library, completely closed to the public for 8 months as part of a 5-year design and renovation effort. JAMA provided structural engineering for the project, which reorganized and enhanced the overall quality of the original 1960’s two-way reinforced waffle-slab structure. New dual entries on the north and south ends connect to the Downtown Glendale surroundings, and new interior spaces and orientation improved function and flexibility within the interior. Structurally the building underwent a voluntary seismic rehabilitation to correct deficient concrete column confinement, a lack of shear walls, and non code-conforming lap length on boundary elements. To address community interests for the highly regarded City landmark, modifications were designed by Gruen Associates and the project team in a manner that preserved the 92,600 SF library’s historic integrity and future eligibility for the National Register of Historic Places and similar preservation categories. The refreshed interior also pays homage to the building’s original “Great Room” and a beloved elevator clock.